"Has New York missed the gas-drilling boom?" "I'm Gonna Make Him a Bond Offer He Can't Refuse"
Is the Stock Market Safe Long-Term? Although you cannot see it in the chart, I continue to climb an extra 20 flights each and every day. It's been 9 months so far. Perhaps I'm having a baby. D'oh! I set a personal best today. I went all out and managed to climb them in 2 minutes and 56 seconds. Surprisingly, I didn't even keel over afterwards (but my legs sure burned). Winter continues to take its toll. I flirt with seasonal affective disorder. I had not realized just how much until doing these charts. Check out this weather report. I can expect one day of partial sun in the next 10 days. I probably won't receive any weight loss, but I will receive total consciousness. So I've got that going for me, which is nice, lol. Sigh. In all seriousness, I expect things to greatly improve once the sun comes out on a regular basis again. It isn't so bad. At least the summers here feel vibrant and alive by comparison. In any event, this is all I'm doing long-term. It either works or it doesn't. At worst, it will do no harm. 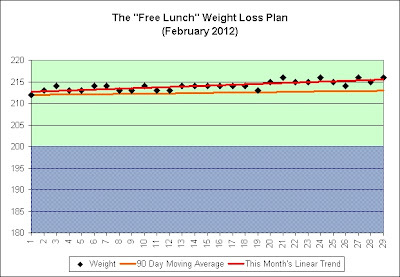 For what it is worth, I am down 10 pounds from when I started. One can only imagine what my weight would be now had I done nothing. Doing nothing is easy. Just look at our political leaders. All of them talk about change. Other than the tens of thousands of lines of tax code offering loopholes to every special interest "fat cat" that can fog a mirror, what really changes? This was part of a response to a couple aged 75 who wanted to know what a "safe withdrawal rate" should be in retirement. So what happens in the unlikely event that stocks do even worse than bonds? The couple spends money aggressively to match the expected aggressive returns. The aggressive returns never materialize. Therefore, they are as f***ed as the typical pension fund. 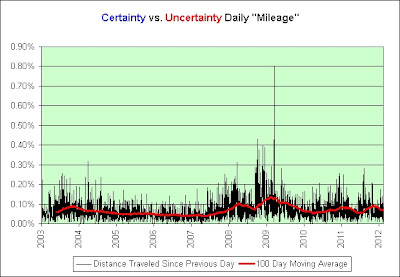 I'd really like to know why financial experts feel that we can "safely" ignore unlikely events, especially when those unlikely events could ruin us financially (think Lehman Brothers or Long-Term Capital Management). Suze Orman didn't share that tidbit of useful insight with the 75 year old couple of course. That million dollars was just 4% of her liquid net worth. Go figure. Let's do some casino math. There are 37 numbered (0 to 36) pockets on the roulette wheel. The green zero pocket is a guaranteed loss if the ball lands there. If I distribute my entire retirement nest egg evenly between all numbers greater than 1 then it is extremely likely that my investment returns will be higher than a more conservative portfolio. Apparently that's all that matters. In fact, there is a 94.6% chance (35 out of 37) that I will earn a 2.9% return (36/35). Instantly! There is only a 5.4% chance that something will go wrong. It is so unlikely. Seems like a safe bet to me. I'm doing it! That means that I can instantly spend 2.9% more money each and every day for the rest of my life. I'll start spending the money right now and place the bet tomorrow. Woohoo!! I'm not really going to do that of course. It does lead me to the question of the day though. Do you think there is at least a 5.4% chance that something will go seriously wrong with this economy again? I think you already know what I think. 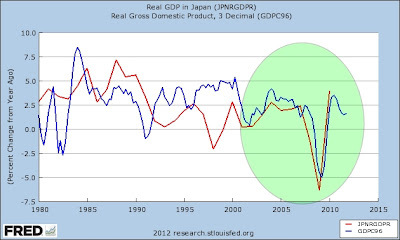 How has Japan's economy done since their housing bust in the 1990s? 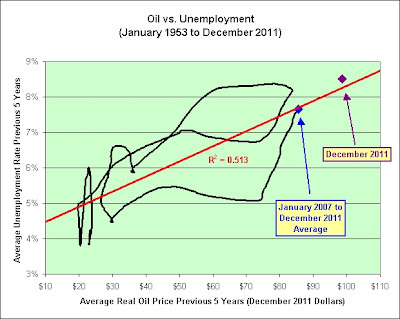 What is the price of oil doing to our economic recovery? Where are the jobs of the future going to come from? What's going to happen to the stock market when the baby boomers decide to embrace less risk in retirement (as I have done)? 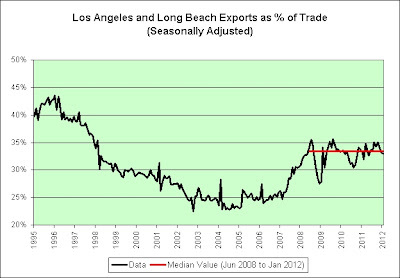 When are we going to fix our unsustainable trade deficit? When are we going to stop borrowing money from our grandchildren to fund our current standard of living? What I object to is that you automatically treat me like an inferior. And how'd you get that? By exploiting the workers. By hanging on to outdated imperialist dogma which perpetuates the economic and social differences in our society. A friend emailed me this Romney quote today and I felt the need to share. That's because they are based, first, on an old benchmark that has lost relevance for a generation -- book value -- and another benchmark that has lost its gravitas in the most recent brutal 12 years of lost performance. Let's go back in time exactly 12 years to verify the wisdom of Jim Cramer. If we talk about price-to-book, we have already gone astray. If we use any of what Graham and Dodd teach us, we wouldn't have a dime under management. A-ha, that just leaves us with tech. That's why we keep coming back to it. That's why, despite the 80% increase in the Nasdaq last year, we are looking at another record year now. It is by that process of elimination that I have picked my top 10. And my next 10 and my next 10 after. Only those companies are worth owning. The rest? It would seem that the past 12 years were a bit more brutal to Jim Cramer than they were to Warren Buffett. So what's the moral of the story? If Jim Cramer is publicly heckling book value again then perhaps we should all start bracing for impact again? Well, maybe. I certainly wouldn't rule it out. 1. It is the total value of the company's assets that shareholders would theoretically receive if a company were liquidated. Or perhaps the moral of this story has a simpler meaning. Jim Cramer, don't quit your "Mad Money" day job!!! Fine Print Disclaimer: This heckle seemed way too easy. Did hidden cameras record my shocked expressions? Am I being Punk'd? Where's Ashton Kutcher? I offer some growth math. 1. Independent restaurants represented 27% of the industry's visits in 2011. 2. Independent restaurant traffic was down 4%. 3. Chain restaurants therefore represented 73% of the industry's visits in 2011. 4. Chain restaurant traffic was up 1%. 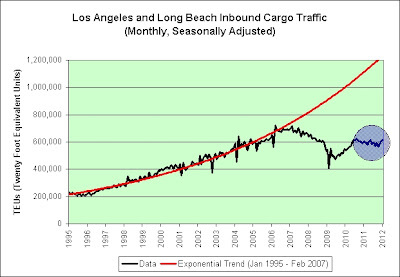 There was no overall restaurant traffic growth in 2011. The meager traffic growth in chain restaurants during this supposed recovery was simply taken from the independent restaurants. Total restaurant industry traffic for the year ending November 2011 was flat compared to a year ago, according to NPD’s CREST. A $100,000 factory job. What's uncool about that? An aspiring machinist -- a popular factory job -- can start training at 18 and then do a one- or two-year manufacturing apprenticeship. In five years, he or she could be making more than $50,000. In 10 years, that could double to $100,000. Could double to $100,000! Sweet! So what would it take? Sedlak's top worker makes $30 an hour. First become the top worker. As an aspiring machinist, that sounds doable. That gets you $62,400. Then what? Pray for 4.83% wage inflation over the next 10 years? Of course, that's not your only option. You are apparently allowed to work overtime until the factory becomes fully automated. Fine Print Disclaimer: No disrespect intended to factory workers. The sarcasm is intended solely for CNNMoney. 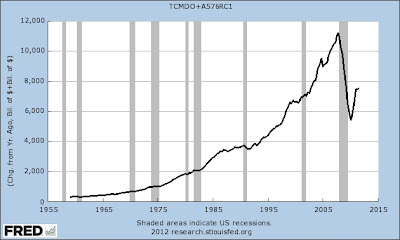 In the following chart I'm taking the monthly U.S. 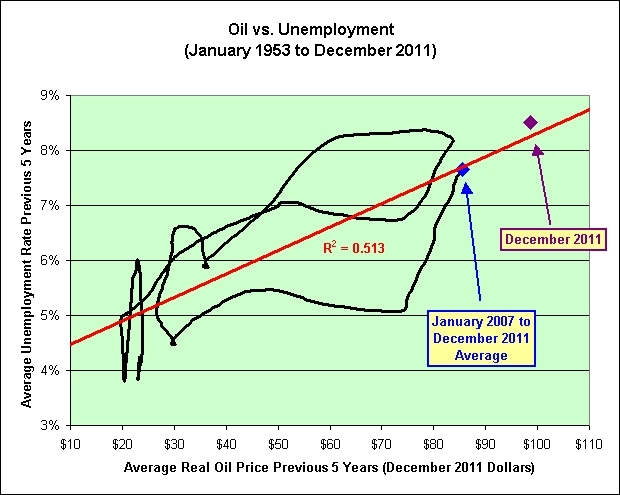 Product Supplied of Crude Oil and Petroleum Products, multiplying by 12 to annualize it, dividing by the population, multiplying by the West Texas Intermediate spot price for oil, and then adjusting the result for inflation as seen in the consumer price index (so it is in January 2012 dollars). 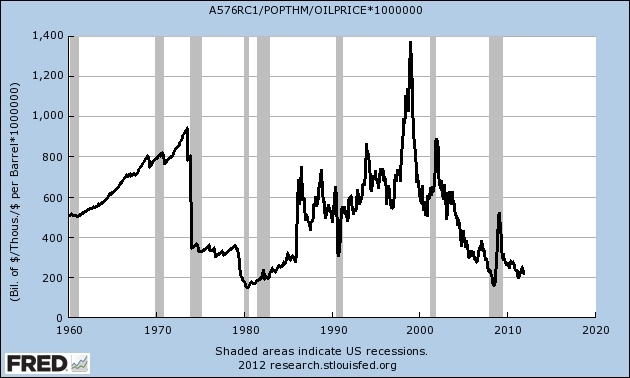 Put another way, it shows the real purchasing power indirectly spent on oil for each and every one of us each year going back to 1981. If you would like to know what a family of three indirectly spends then simply multiply by three. 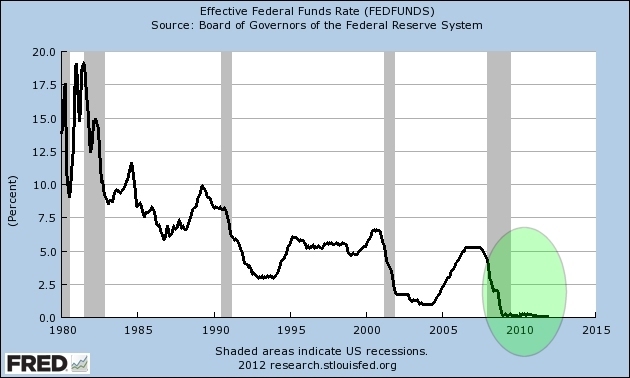 1. Who thinks the Fed is miraculously saving this economy long-term? 2. When this latest exponential trend in red fails again (and it will with 100% certainty) then will the stock market fail again too? You are probably wondering how I can be so certain that the trend will fail again. Let me show the math. A 9.8% growth rate means that the amount spent doubles every 7 1/2 years. 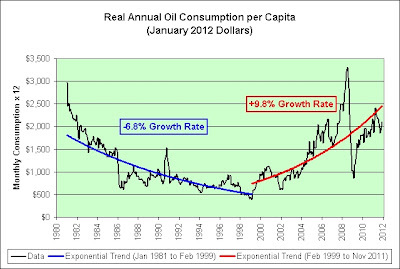 That means that in 30 years each and every one of us could expect to spend roughly $40,000 on oil each year (adjusted for inflation). If you think the consumer is tapped out now, then you haven't seen anything yet. It's not going to happen. To nearly quote Dune, there would be demand destruction the likes of which even God has never seen. 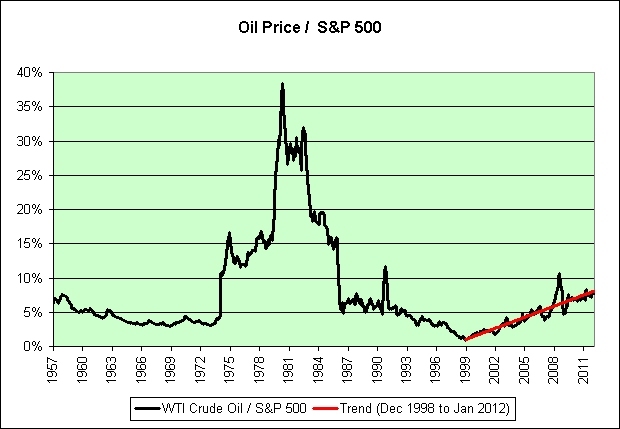 Of course, oil could fall and not take the stock market with it. That's always a possibility. Perhaps real prosperity is in our future again. I'd not bet on it though. Oil, oil, oil, oil... that's all we seem to talk about. It reminds me of a favorite quote. The same can also be said of those who try to comfort you. This post inspired by Troy from the comments of the last post. JW: As an investor, Q1 is the time to acquire positions in quality assets, when prices are coming off their lows. Then, you have to be prepared for post-electoral volatility. That is when they will seriously try to tackle the debt ceiling and will stop printing money. But that will not matter until 2013. 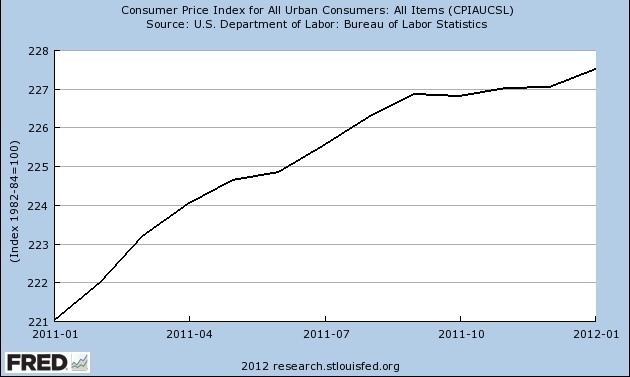 This year, 2012, is all about the illusion of prosperity. Perhaps the Mayans were right after all. We're going to party like it's 2012. Small-business owners who need quick access to capital have a burgeoning industry eager to fund them: merchant cash advance providers. The decade-old industry has grown significantly in the past two years, to more than 50 providers, observers say, and the tight credit environment is fueling demand. As interest in their business grows, providers—who charge premiums of 30% or more on the money they advance—are trying to promote industry standards to avoid scrutiny from regulators. Almost one in four small-business owners who are currently not expanding their workforce, 24 percent, said they are holding back from hiring because they are worried about no longer being in business in 12 months. It all raises the question: Has New York missed the gas-drilling boom? Most experts say no, but several said low natural-gas prices could have an effect on the pace drillers set in New York should the state allow high-volume hydrofracking. Which natural gas boom? There are so many to choose from. Low natural-gas prices? 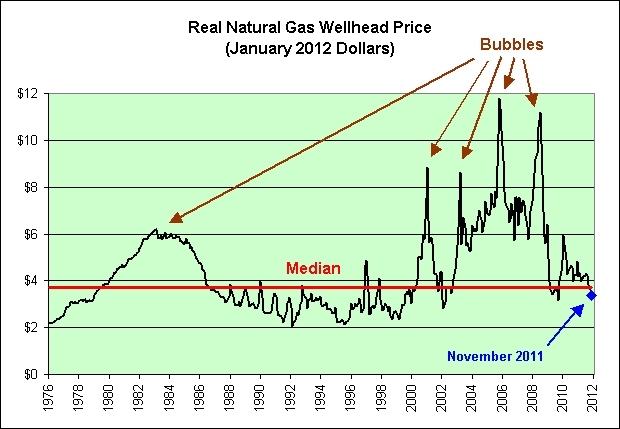 Natural gas is pretty much right on the long-term inflation adjusted median. 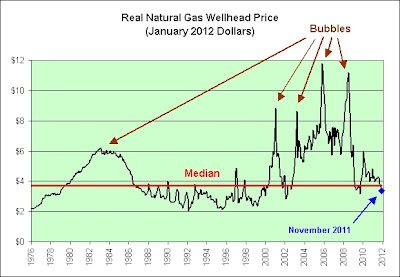 Call me skeptical, but did New York (Wall Street) really miss the natural gas bubbles of 2001, 2003, 2005, and 2008? All four of them? Seriously? The awkward silence is deafening. Must... break... the... ice. "Lots of weather we've been having lately!" In all seriousness, if we can't even hyperinflate natural gas long-term then what are the odds that we can hyperinflate our wages, our housing markets, and/or the contents of our wheelbarrows? Has there really been 150 of these? Time flies when you're heckling I guess. Well, let's see what I can do to make this milestone memorable. Absolutely. We need a fabulous economy in order to withstand a major shock. At the very least we need an economy that is still very strong. And don't even get me started on Jeremy Siegel. He rejected the notion that there was an illusion of false stock market prosperity? Oh yeah? Well, I reject the notion that the illusion of false stock market prosperity should be rejected! So there. I just don't know how I could make it any more clear than that. Psst. Anyone have a quadruple-negative grammar calculator to check my work? I don't want to be on the wrong side of this prosperity trade. I strongly suspect that I am. The wording is dizzying, lol. In Standard English, two negatives are understood to resolve to a positive. This rule was observed as early as 1762, when Bishop Robert Lowth wrote A Short Introduction to English Grammar with Critical Notes. For instance, "I do not disagree" could mean "I certainly agree". Further statements may be necessary to resolve which particular meaning was intended. Because of this ambiguity, double negatives are frequently employed when making back-handed compliments. The phrase "Mr. Jones was not incompetent" will seldom mean "Mr. Jones was very competent" since the speaker would have found a more flattering way to say so. Instead, some kind of problem is implied, though Mr. Jones possesses basic competence at his tasks. There was no way we could not have prospered like we did not if not for the excellent financial advice that the financial experts did not offer. The lingering recovery of the U.S. economy has caused restaurateurs to adapt to a "new normal," one in which they are now more efficient and innovative in order to increase sales and profit margins. This article gave me an innovation flashback. A former executive where I once worked said something so profound that it is now permanently etched into my brain. "We have a fun environment with creativity and fun." That environment no longer exists. The ongoing and seemingly never ending rounds of layoffs eventually took their toll. We have an innovative environment with creativity and innovation no doubt. If we can simply translate the overwhelming successes of financial innovation into every other aspect of our lives, we'll all be eating cat food from the comfort of our cardboard boxes in no time. Well, we made it through the Christmas season without a deflationary event (barely). I'm therefore changing my short-term inflation mood (as seen in the upper left hand corner of my blog) to match my long-term one (between 2% and 3% per year?). I expect it to stay there until we start approaching the Christmas season again. Please note that in a perfect world the Christmas season shouldn't matter. 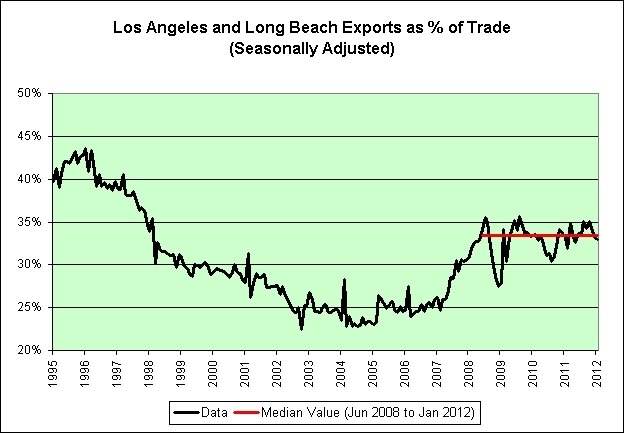 This is seasonally adjusted data. It should therefore be factored in already. Unfortunately, we don't live in a perfect world. I expect the next Christmas season to be more deflationary than expected on a seasonally adjusted basis, just as this one was. I offer this for entertainment purposes more than anything. I don't invest based on the short-term. 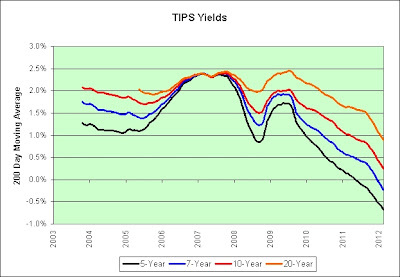 I continue to hold inflation protected TIPS and I-Bonds for the long-term. Just opinions. Your inflation mood results may vary. That's a whole lotta nothin'. Creating fake Treasuries is a “common scam, especially in Italy,” he said. The tipoff was the “astronomical” face value of each bond, he said. Fake bonds in high denominations are more common in Europe, where people are less familiar with the face value of U.S. Treasury bonds than in the U.S., he said. This would probably be a good time to mention that I prefer to buy U.S. Treasury bonds directly through the government and cut out the middlemen. First add annual wage and salary disbursements to the year over year change in total credit market debt owed. 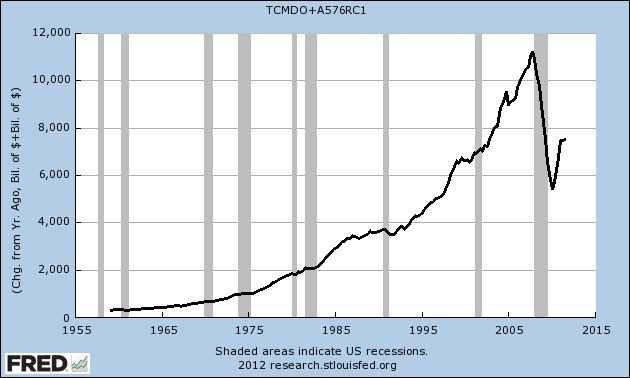 For the sake of argument, let's think of this as our long-term spending power. We can get paid to work *and* we can apparently endlessly borrow money (sarcasm). We cannot endlessly spend saved money of course. It would eventually run out. I have therefore not included it. 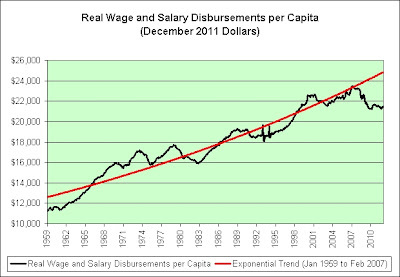 As you can clearly see, there has been an epic exponential trend failure in our long-term spending power. Now divide that amount by our country's GDP. 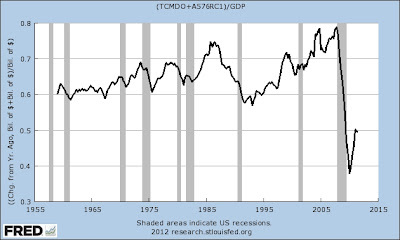 This shows long-term spending power as a percentage of our GDP. I am confident that we can eventually get back to 60%. 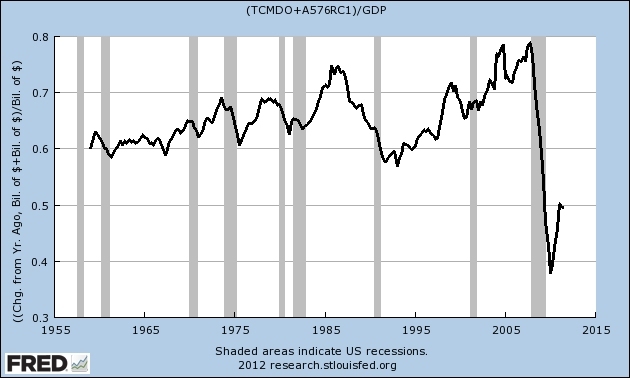 All it would take is for our real long-term spending power to go up, our real GDP to come down, or perhaps even both. Who thinks our real long-term spending power is going to rise much from here? Based on what I chose to name my blog several months before the first chart peaked (seriously), I think you can make an educated guess what I think. In any event, I don't see real yields rising much unless the economy strengthens substantially. I'm certainly not predicting that. I see plenty of long-term problems. Should the economy continue to deteriorate (seems much more likely), then the death of real yields will more than likely continue. See this previous post for commentary regarding the following charts. All of it still applies. Ben Bernanke must be very pleased with the results. Who doesn't love certainty? First the bad news. A decade ago we entered the era of unpredictably poor long-term investment returns. Few could see it coming. Here's the good news. We now appear to be entering the era of predictably poor long-term investment returns. Everyone should see it coming. 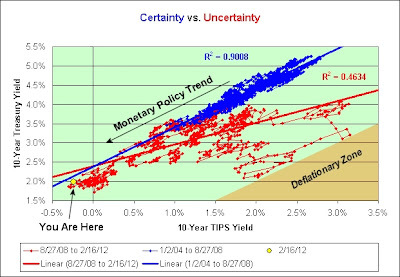 It shouldn't take a rocket scientist to see that negative real yields on 10-year bonds won't create prosperity. Of course, we can't all be rocket scientists. California Public Employees’ Retirement System, the largest U.S. public pension, should consider changing its assumed rate of investment return, its actuary said. Trimming the forecast may add to taxpayer costs. The rate, now 7.75 percent, is used to calculate how much money the $234 billion fund expects to have and how much it needs to cover benefits promised to workers, as well as the size of annual contributions by state and local government. You think? Perhaps what they lose in the bond markets can be made up in the equity markets. That seems to be the thinking. Good luck on that theory long-term! Sales, schmales. Let's talk employees. 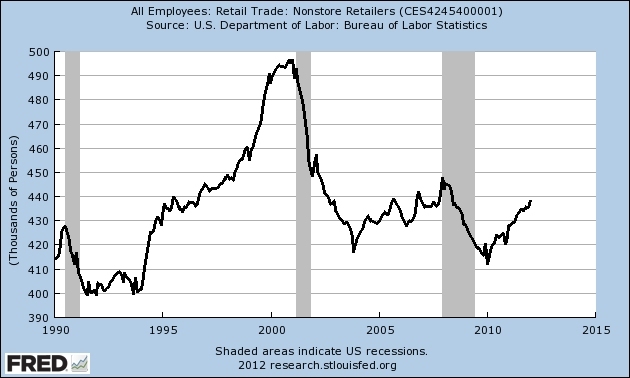 That's nearly two decades of nonstore nonjob growth. 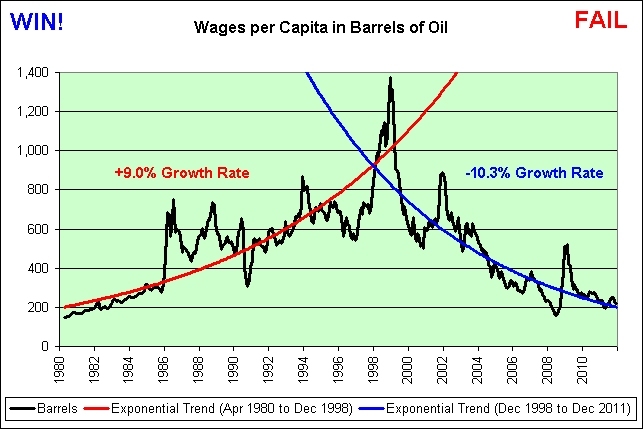 This chart shows what happens if we convert wage and salary disbursements per capita into barrels of oil. We peaked at 1,376 barrels in December 1998. 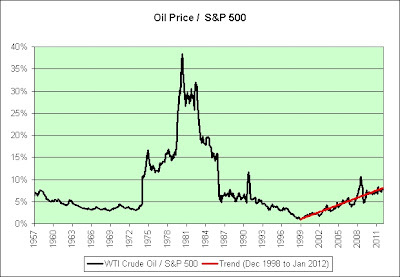 The low was 150 barrels in April 1980. As of December 2011, we're back down to 218. We may have fallen off one exponential trend, but at least we found another! Hurray! 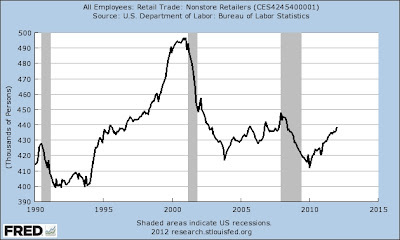 Theory #1: The intended consequence of ZIRP is to create wage inflation so that people can afford to drive to work, can afford to shop at this country's many shopping malls, and can afford to live in their homes. 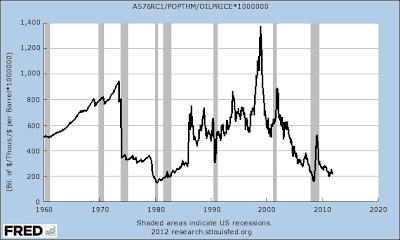 Theory #2: The unintended consequence of ZIRP is to create oil inflation so that people cannot afford to drive to work, cannot afford to shop at this country's many shopping malls, and cannot afford to live in their homes. What happens if we combine the two theories? You end up with frustratingly powerless monetary policy. The lousy housing market continues to be a "key impediment" to a faster economic recovery, Federal chairman Ben Bernanke told home builders Friday in Orlando, Fla. In a speech streamed live on the Internet, Bernanke said while resurgent housing markets had stimulated recovery in the past, that's not the case this time. It has been a frustratingly slow recovery, Bernanke said. Let's just say that I have a vivid imagination. Longtime readers know that I am a fan of William Pesek. It doesn’t take a Nobel Prize to know that paying off debt gets harder when you’re running out of people. I would argue that having a Nobel Prize might not even help. LTCM was founded in 1994 by John Meriwether, the former vice-chairman and head of bond trading at Salomon Brothers. Board of directors members included Myron Scholes and Robert C. Merton, who shared the 1997 Nobel Memorial Prize in Economic Sciences for a "new method to determine the value of derivatives". Initially successful with annualized returns of over 40% (after fees) in its first years, in 1998 it lost $4.6 billion in less than four months following the Russian financial crisis requiring financial intervention by the Federal Reserve Bank, and the fund closed in early 2000. LTCM's strategies were compared (a contrast with the market efficiency aphorism that there are no $100 bills lying on the street, as someone else has already picked them up) to "picking up nickels in front of a bulldozer" – a likely small gain balanced against a small chance of a large loss, like the payouts from selling an out-of-the-money naked call option. Wall Street continues to bulldoze at the wheel. What could possibly go wrong? Assuming that we wished to stay on the long-term prosperity trend, the typical family of three is missing about $10,000 per year. Perhaps the next president can cut us all a check (each and every year from here on out). That's assuming that all the free money won't be inflationary of course. If it is, then the government will need to make the checks bigger to compensate. Gallows Humor Monday has spilled into Tuesday. I thought for sure that it would be contained. Oh well! Here's an alternate solution. We admit to ourselves that this is yet another long-term exponential trend failure and there is nothing that can be done to "unfail" it. That might be a start. Nah, that sounds painful and dangerous. Can't have everyone turning as frugal as I am or everything falls apart. Perhaps all we really need is a leader who understands capitalist/socialist utopia theory. Truth be known, I think they all do! 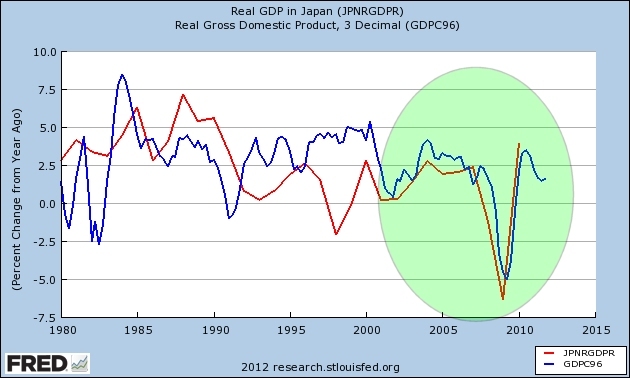 The chart above compares Japan's real GDP growth to ours. That’s zero interest rate policy. And it has arrived. America has turned Japanese. And it is still with us more than three years later. WASHINGTON (AP) – The Federal Reserve's announcement that it is unlikely to raise its benchmark interest rate until late 2014 is simply its "best guess," Ben Bernanke said Wednesday. That would make it an additional three years for a grand total of six years. Of course Ben "There Is No Housing Bubble to Go Bust" Bernanke isn't well known for his accurate guesses. I would therefore be tempted to favor Murphy's Laws over his best guesses. Every task takes twice as long as you think it will take. If you double the time you think it will take, it will take four times as long. The following chart shows the total net worth of households and nonprofit organizations divided by wage and salary disbursements. I now offer three different ways to look at this data. Keep in mind that they are just my opinions though. 1. 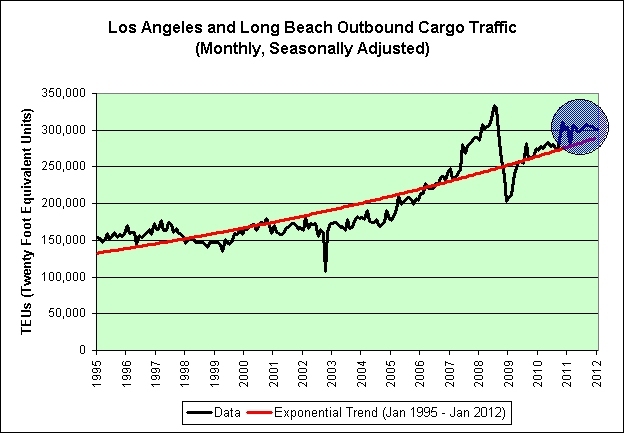 We could simply return to the blue median trend line someday. I certainly don't see any reason why we couldn't. We can't blow bubbles forever. At some point, we'll simply run out of ideas. 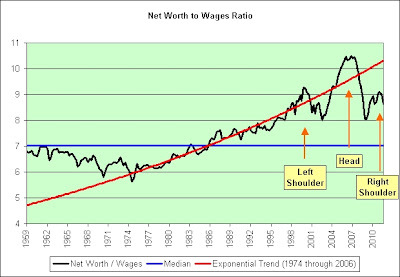 If we do return to the median trend line, then the most likely outcome would not be that wages rose to justify the current net worth. 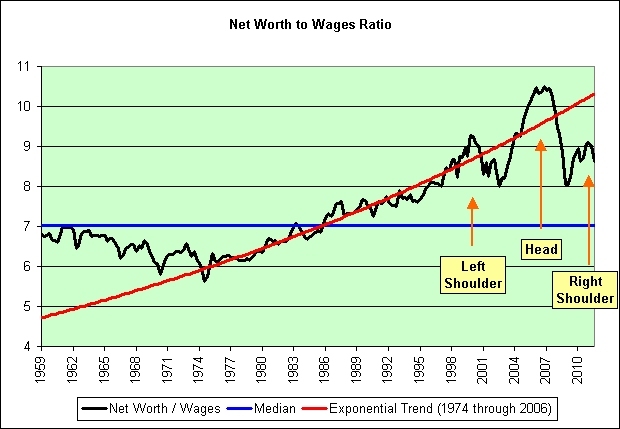 Rather, I think the evidence would support the idea that net worth would fall relative to wages. 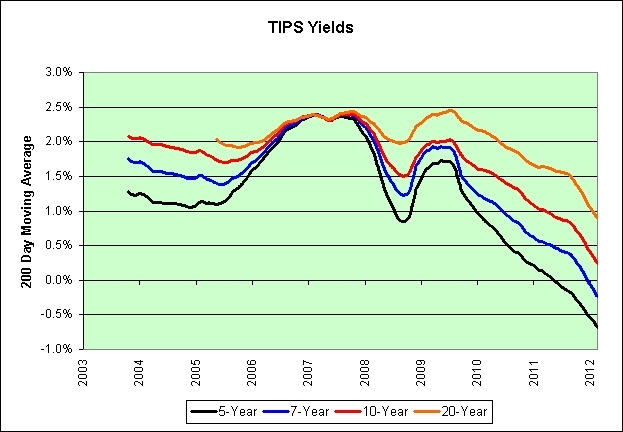 One piece of supporting evidence is that the real yield on the 10-year TIPS is negative. Investors are now willing to lock in a small loss over the next decade for fear of what alternative investments may yield. 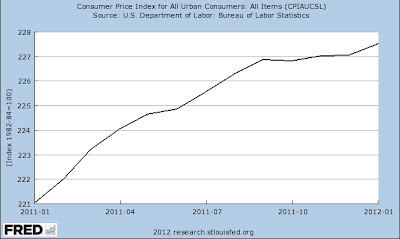 Another piece of evidence that supports this theory is that housing prices are still falling. 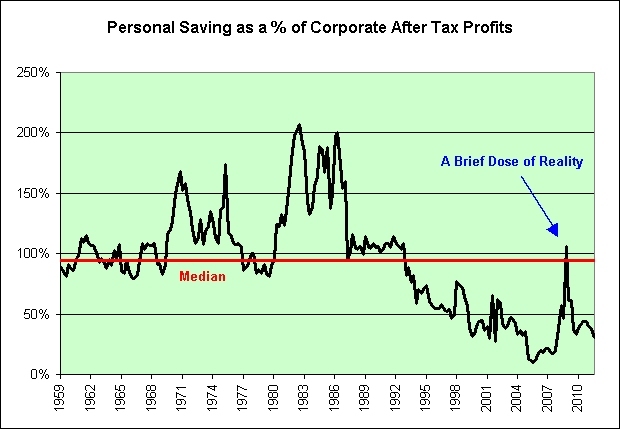 And lastly, contrary to popular opinion the stock market is not cheap. It has more than doubled from the bottom found just a few years ago. We're now in squeezing blood out of a turnip mode. Good luck on that one. 2. 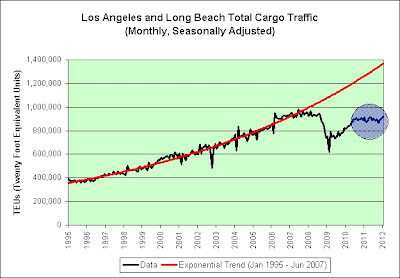 From 1974 through 2006 we were on an unsustainable exponential growth path (as seen in the red trend line). Many believed they could extrapolate it forward forever. Note that hindsight shows that it could no more be extrapolated forward starting in 2007 than it could be extrapolated back into the 1960s. This trend has failed both going forward in time *and* going backward in time. There's no getting it back. 3. I'm not a fan of technical analysis. It's just tea leaves and crystal balls to me. That said, there is a head-and-shoulders pattern in the data and I have shown it on the chart. The "head-and-shoulders" pattern is believed to be one of the most reliable trend-reversal patterns. If you do believe that technical analysis has merit, then make of it what you will. I'll stick to points #1 and #2 personally, which offer the same conclusion. 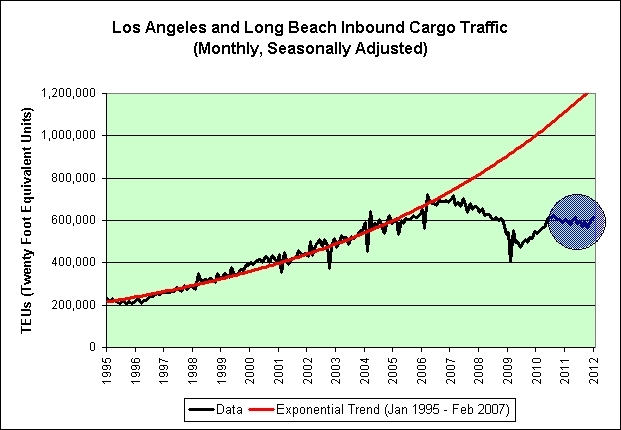 It is one thing to have an exponential trend failure when there has been exponential growth. 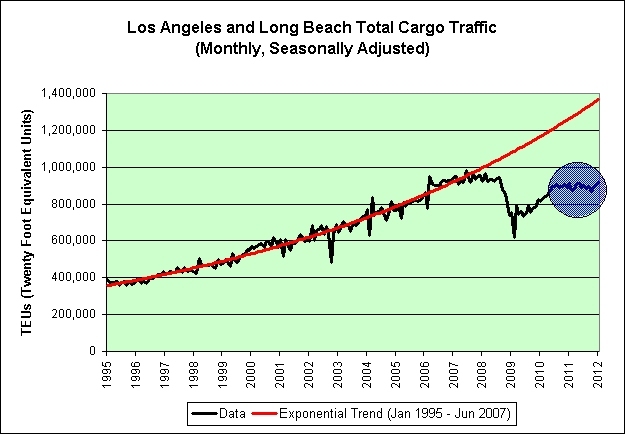 It is another thing entirely to have an exponential trend failure when there has been exponential decay. Note how far below the trend line we currently are. That's just sad. So what are some of us doing with all that free time? Speaking as a guy, we make up 93% of the prisoners under the jurisdiction of state or federal prisons or in the custody of state or federal prisons or local jails. From foreclosure frauds to subprime shenanigans, mortgage fraud is a growing crime threat that is hurting homeowners, businesses, and the national economy. It isn't all bad news. At least I found a growth industry in an otherwise stagnant economy. That's something I guess. Sigh. This post was inspired by Jazzbumpa from the comments of the last post. 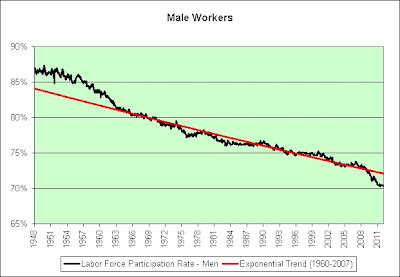 He claimed the labor participation rate trend for men was even more disturbing than it was for women. Can't say I disagree. 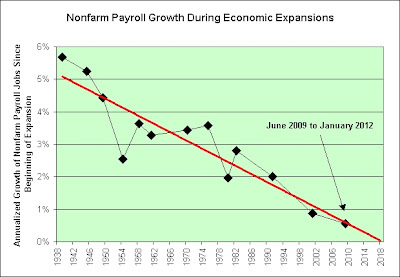 The following chart should have served as an early warning sign that there would be many more economic growth failures to follow. 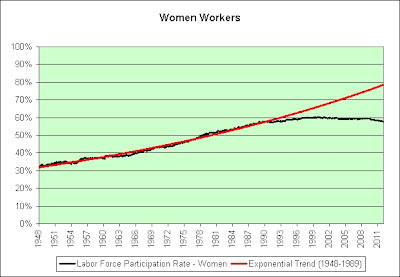 Women entered the workforce in exponentially increasing numbers. It allowed us to grow faster than we otherwise would have. That tailwind is now gone. 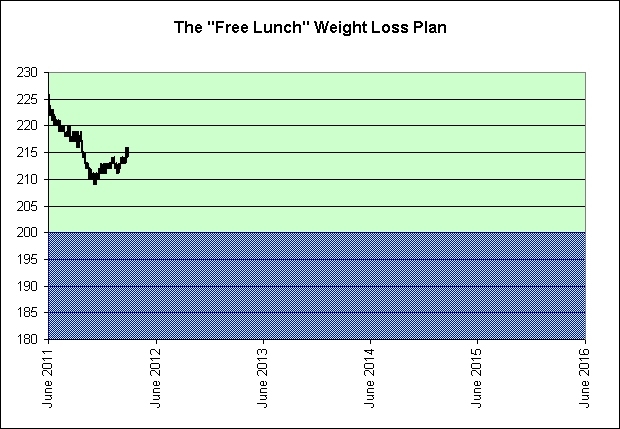 This is a followup to the chart I posted yesterday. Note what happens on or around the year 2018 in both charts. Clearly both of these trends cannot continue. 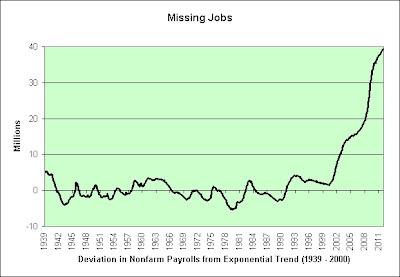 It would make no sense that jobs would be lost during economic expansions *and* jobs would be added during economic contractions (recessions). 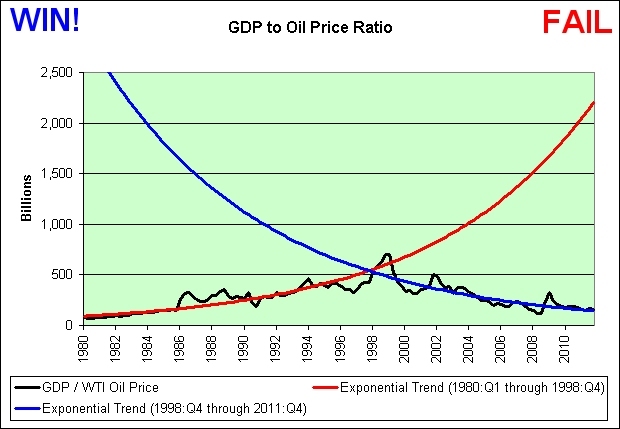 Of the two charts, the first is the most suspect if only from a common sense perspective. 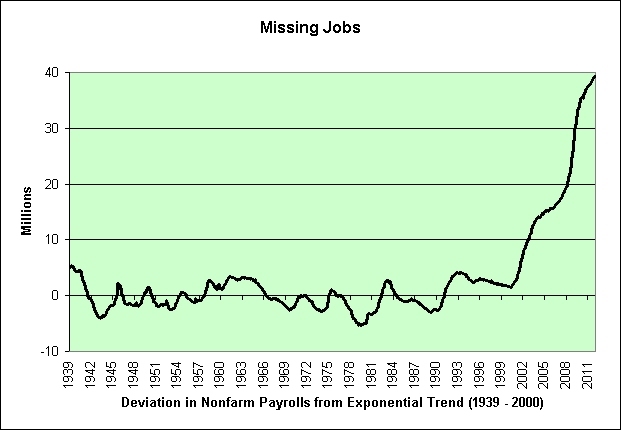 Jobs will more than likely not be added during future recessions. 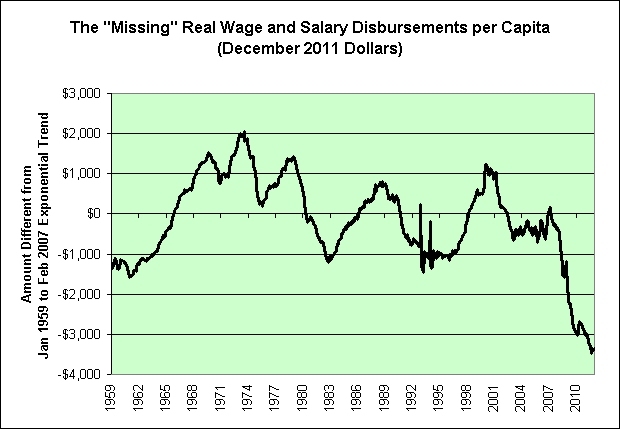 Further, that chart appears to be rolling over. 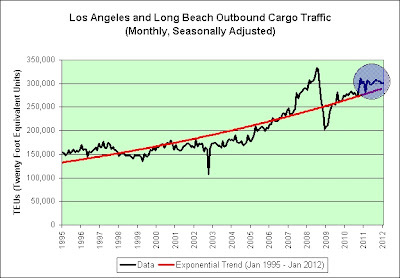 I therefore do not trust its trend line (not that I ever actually trust trend lines). I offer a somewhat tongue-in-check alternative theory that could also explain these two charts. Starting in the year 2018 we will enter a period of "greatest moderation". No jobs will be created during expansions and no jobs will be lost during recessions. We'll just muddle along indefinitely and without much to show for it other than a continually rising national debt and ever expanding food stamp program. Good times, good times. Keep in mind, it is just a theory. 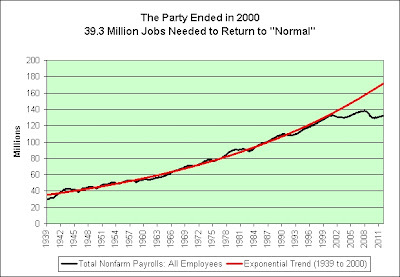 At first glance, this is an improvement from the 39.5 million missing jobs last month. 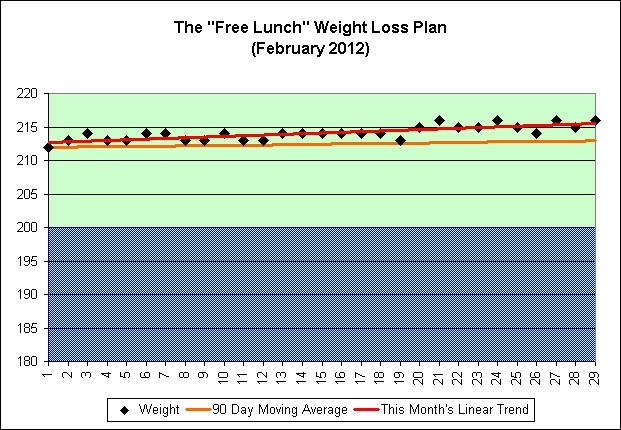 However, this improvement actually came from revisions in the data. Last month was not as bad as originally reported. As strong as this month's employment report was, we continue to drift away from the trend established between 1939 and 2000. In order to simply maintain our distance from the trend line, an additional 73,000 jobs would have been needed (on top of the 243,000 jobs that were actually added). 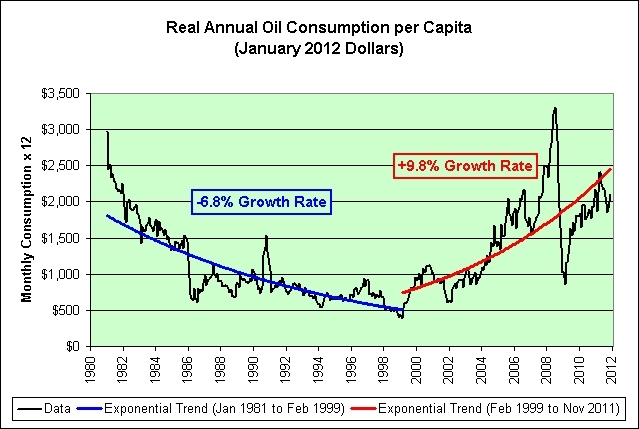 Simply put, this exponential trend has failed and continues to fail. First the good news. Year over year employment growth was 1.5%. That's not a bad number at all in absolute terms. It is above the rate of population growth. What more could we ask? Now the bad news. 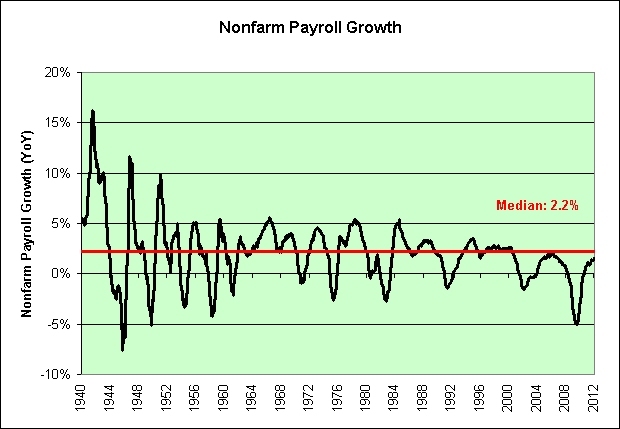 In relative terms, it is still well shy of the 2.2% median historical growth. 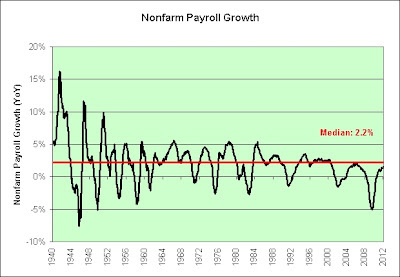 Consider too that the median value also includes periods of recessions. 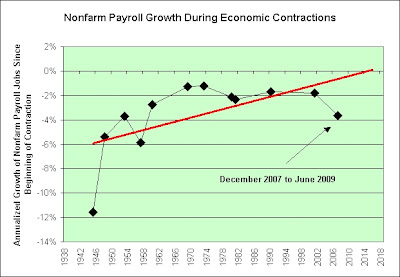 If recessionary periods were therefore removed for a direct apples to apples comparison (since we are not currently in a recession), then we'd be doing even worse on a relative basis right now. Further, I am not even going to mention just how much added government debt it is taking to attain this 1.5% employment growth. Oops. I said I wouldn't do that. Sorry! So here are a few rhetorical questions on my mind. What will happen to the 1.5% growth that we are currently experiencing when the next recession hits? 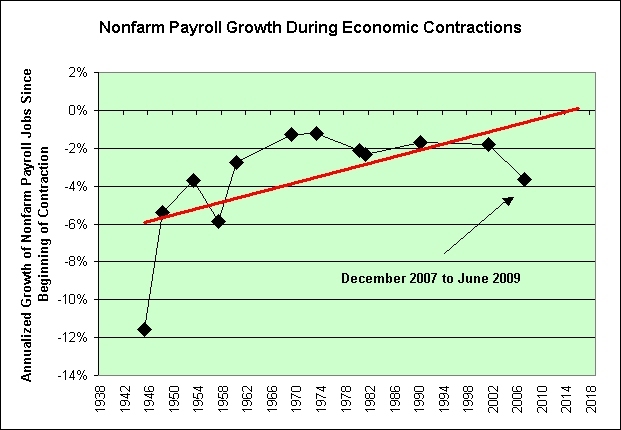 Or has the government miraculously guaranteed that recessions will never occur again? 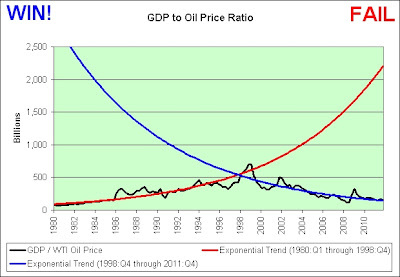 If a miracle has in fact occurred, then what exactly makes our weakened economy permanently resilient? And whatever it is, why weren't we doing it all along? In all seriousness, I strongly believe that a sustainable 2.2% employment growth rate will never occur again (counting future recessions). 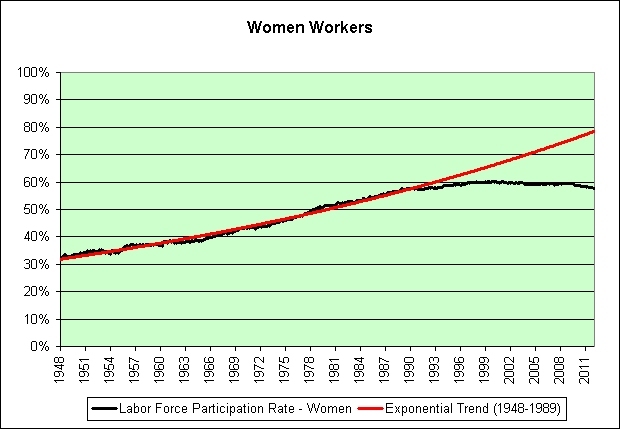 At best, I would argue that employment growth cannot exceed the rate of population growth long-term (unlike the period from 1939 to 2000 due to women entering the workforce). At worst, hello robots (and demographics). 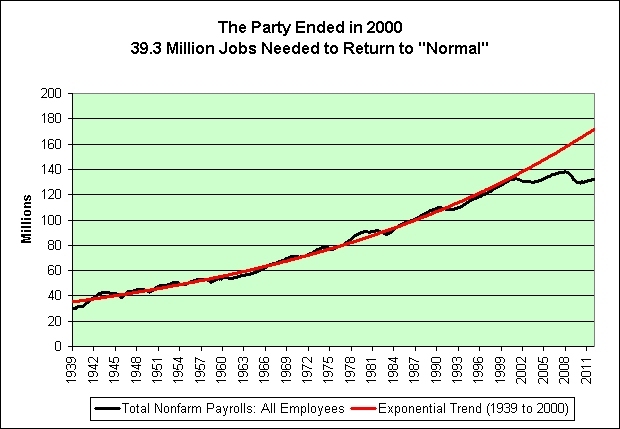 In any event, this long-term exponential trend in employment has failed and there is absolutely nothing that can be done to "unfail" it. As I have said before, this draws into question every other long-term exponential trend that this country has experienced (many of which are also failing). Here's my wish list for 2012. I'm feeling pretty good about my list. I think there's a good chance that one of them may come true. I should probably mention that I had dental work done earlier today. I managed to swallow half of a gold crown. It has sharp edges since it was cut in half as part of the removal process. Seriously. If just one thing on the list can come true in 2012 then please let it be the last one! "A cottager and his wife had a Hen that laid a golden egg every day. They supposed that the Hen must contain a great lump of gold in its inside, and in order to get the gold they killed it. Having done so, they found to their surprise that the Hen differed in no respect from their other hens. The foolish pair, thus hoping to become rich all at once, deprived themselves of the gain of which they were assured day by day." I don't want anyone getting any crazy ideas! At best, this is just a one time event and not the source of everlasting prosperity, lol.